A 90-year-old Manchester woman was injured after she lost control of the vehicle while exiting her driveway and struck three houses and a tree in the Leisure Village West section of the Township Thursday morning. Maria T. Pannizzo of Buckingham Drive, lost control of her 2002, Toyota Camry while pulling from her driveway and left the roadway on three separate occasions, striking three nearby houses before coming to a stop after impacting a tree and rolling over. She was transported to Community Medical Center in Toms River for treatment of injuries sustained during the crash. 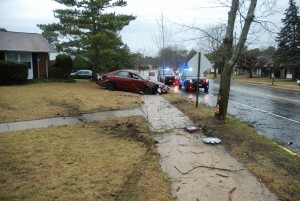 On January 26, 2017, at approximately 8:30 a.m., officers from the Manchester Township Police Department responded to the area of Yorkshire Court and Buckingham Drive in the Leisure Village West section of the Township for the report of a single vehicle crash in which a car struck several houses and a tree. Upon arrival, officers located the involved vehicle, a 2002 Toyota Camry with heavy damage on the side of Buckingham Drive. 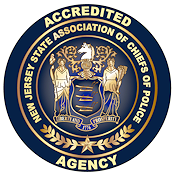 The initial investigation revealed that Pannizzo was backing from her driveway and was attempting to turn left onto Buckingham Drive when she over-accelerated and left the roadway and impacted the side of 60A Buckingham Drive. 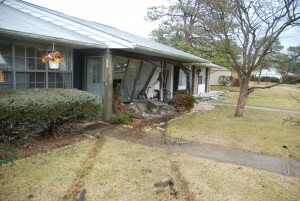 After striking the side of the Buckingham Drive residence, Pannizzo put her vehicle in reverse and accelerated backwards onto Buckingham Drive. While in reverse, her vehicle left the roadway a second time and impacted the sun rooms of 1C and 1D Yorktown Court. After striking the above residences, Pannizzo put her vehicle back into drive and accelerated forward once again crossing over Buckingham Drive. In doing so, she left the roadway a third time and travelled in a north direction on the grass parallel to the Buckingham Drive for several hundred feet before impacting a tree. The force of the impact caused Pannizzo’s vehicle to roll over 360 degrees before finally landing back on all four wheels. Ms. Pannizzo, was traveling alone at the time of the crash and it appears as though she was not wearing her seatbelt. She was transported to Community Medical Center in Toms River by EMT’s from Quality Medical Transport for complaint of pain as well as a possible broken arm and hand. Assisting at the scene were Inspectors from the Manchester Township Building Department, workers from Leisure Village Maintenance, utility crews from Jersey Central Power and Light. The crash is under investigation by Cpl. Douglas Higgins of the Manchester Township Police Traffic Safety Unit with the assistance of Officers George Smith and Stephen Hankins of the Patrol Bureau.